Survey conducted by the National Media have been favourable to TRS in Telangana. On Monday, NDTV declared KCR is all set to retain power in the youngest state. And now, India Today too predicts the victory of the Ruling Party. 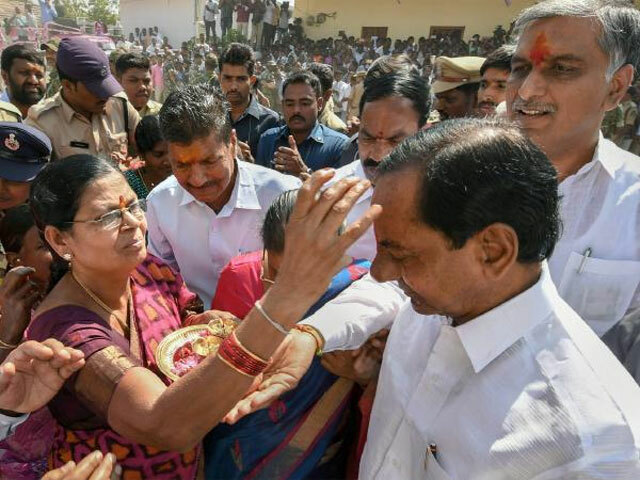 As per the Political Stock Exchange (PSE) survey released by India Today, About 48 percent of people in Telangana want TRS to retain power. In the survey conducted last month, The Ruling Party got the support of 44 percent people. Which indicates, TRS strength increased in the recent past. 6,877 Samples have been conducted in 17 Lok Sabha Constituencies. While 22 percent of people told they don't have any opinion on TRS Government in November, This percentage has fallen to 14 in December. According to the survey, TRS is super strong in North Telangana and Congress can influence the voters in South Telangana. Ruling Party grew stronger in the rural areas in Hyderabad. MIM continues to dominate in the Old City. TDP could create an impact only in Khammam and Ranga Reddy. Though BJP is contesting in all the segments, It can leave its impact only in the Urban Constituencies. Video Message: Sonia Urges Telanganites!